The 30" Carabiner Style Badge Reel is a Clip-On Retractable Badge Holder (Translucent) with a standard button clasp loop that can be attached to a belt loop, bag, or pocket. Available in 6 different colors and customized with a 1" x 1 1/2" color imprint with up to 2 colors. Color assortments may be available. Are you looking for a promotional product that has enough style and utility to be the choice of clandestine agencies? This rugged badge reel has a carabiner, allowing you hike with all of your gear to the top of a secret mountain base and look snazzy while checking into the security checkpoint with your retractable badge. 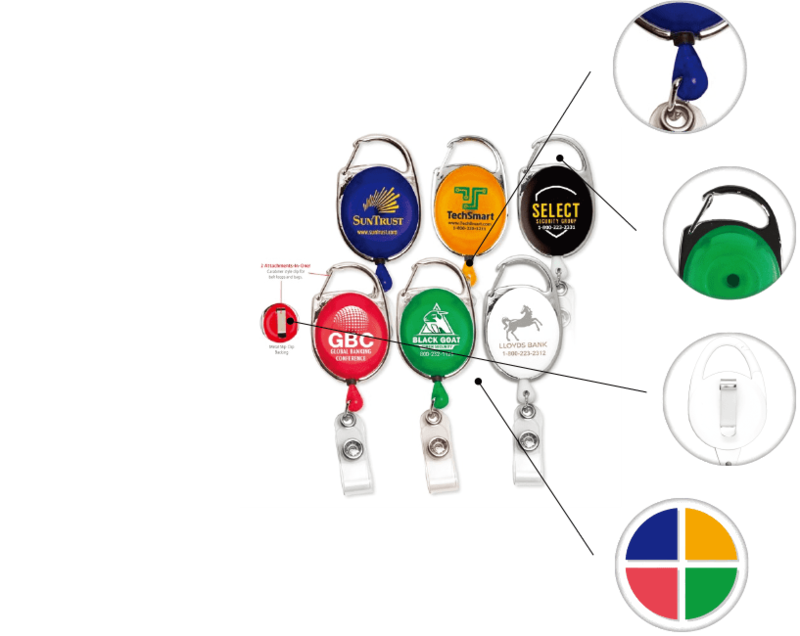 Whether you're looking to brand your guest badges or get people to add your branding to their work identification, these quality carabiner badge clips are highly demanded giveaway. With a carabiner clip allows it to be attached to bags and belt loops and a slip clip that can be securely attached to a pocket, this badge holder can be worn with any outfit. Great for conferences, camps, and company outings! Button clasp loop strap for standard ID tags. Cord on the Retractable Carabiner Style Badge Reel is 30" long. Metal clip on the back to attach to clothing. Carabiner clip for easy attachment to bags and belt loops. Two color imprint available on the front of the badge dome. Comes in multiple colors, assortments may be available. 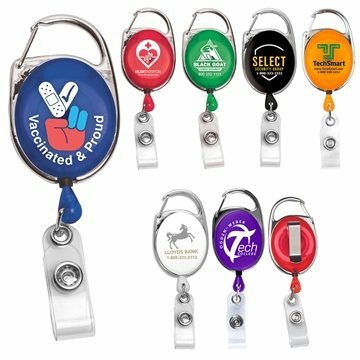 This retractable badge reel is a customer favorite because it can be used in a variety of ways. With the carabiner clip, it can be attached to a belt loop or bag. With the metal slip clip, the badge holder can be attached to the outside of a pocket. Has a 30" retractable cord that makes it easy to hold up badges for security checkpoints or badge scanners. Features a carabiner clip on the top and a metal slip clip on the back, allowing it to be clipped to a belt loop or attached to a pocket. This custom badge reel has a button clasp loop strap at the bottom to attach a standard ID tag or badge. The 30" Carabiner Badge Reel is available in 6 different colors and customizable with 19 standard imprint colors or custom PMS colors. Hard Acrylic ID Holder — 3.75" x 1.5"
Very nicely made. I have ordered these multiple times from AnyPromo. I have tried this product on other sites, and it doesn't compare to the AnyPromo product. LOVE. Great product. Clean graphics and the employees love the option to clip it or hook it. Would order again. The product was exactly what we wanted, it was well received by our employees and it looked awesome with our logo on it. © 2019 AnyPromo Inc. All rights reserved. Privacy Statement.